Necessary feature such as filter booster pump, filtration package, inbuilt cleaning system, automatic pressure regulation, flow control, full instrumentation and fail-safe protection are fitted as standard – not as expensive ‘options’ as in the case of many other systems. The basic system design allows for a building block concept or modular expansion to incorporate-either at the factory or as a later retrofit-additional facilities to meet the changing needs of the operator. 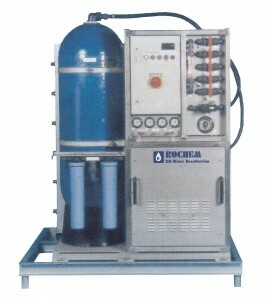 For example, raw water pre-heaters can be included with no modifications to the basic system. 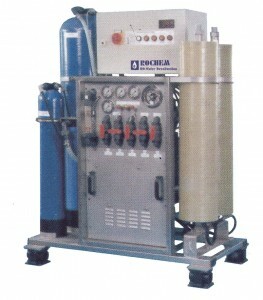 Carbon filters, pure water distribution systems, ultra violet and/or chlorine dosing systems etc. can also be easily interfaced with the basic system. Modular construction and purpose-designed clear access to all major components and piping means that inspection and preventive maintenance can be carried out quickly and effectively. Automatic operation and regulation of the system, fail-safe design and fault indication facilities ensure correct, safe and reliable operation of the system. A fully documented computer ‘history’ with details of all component parts used is developed for each system produced and a comprehensive spare parts and consumables inventory is maintained by Rochem to provide the operator with a quick response after-sales service. With 10 different capacities up to 350000 litres/ 24 hours for sea water application and a similar number up to 500000 litres/ 24 hours for brackish water, Rochem can usually meet at short notice most customer requirements from its standard range. If not, larger capacity systems or more specialized systems are available on request. Since every Rochem RO system is completely assembled and fully tested prior to dispatch from the factory and can be in full operation literally just a few hours after arriving on site. There are only four fixed or flexible pipe connections to make plus an electrical supply. Nothing else.